Youtube giving very low income, so now launching paid-online classes at Unacademy. Previously, I used to upload full length free lectures on YouTube wherein, the students will get the content for free while YouTube will pay me for the advertisement. But, over the years, e-Learning channels have mushroomed while the number of advertisement sponsors & their marketing budget have not grown at the same speed, so every Youtube channel receives less money than before, even with increased number of subscribers. Then e-learning-walla Youtubers are forced to rake up more daily-views by offering daily news analysis, pib updates, Rajya sabha summaries etc. But even with all that Tomfoolery and Rat-race this whole free-content fish-market is giving diminishing returns. So, then they have to monetize their fame by selling PDF modules, online mock test , offline classes and so forth. I tried to hold off as long as I could, but my Youtube earnings have declined greatly because of all these. So, time to accept the realities and embrace the ‘dark side’ i.e. charging money for teaching. So, here comes my paid live-course on Unacademy’s Plus Platform. 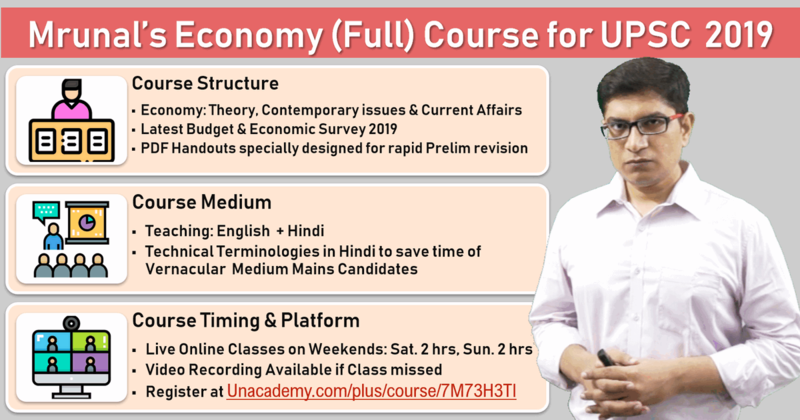 Course Content: I’ll be teaching Economy including its theory, Contemporary Issues & Current Affairs including the latest Budget & Economic Survey 2019. Target Exam: UPSC Civil Services IAS/IPS Prelims 2019. Medium of Instruction: English & Hindi. Study-Material: PDF handouts for Rapid Revision before the Prelims with Hindi terminologies for technical words so that vernacular medium mains aspirants’ time is saved. Thus, it’s a weekend batch, so, working professionals can also attend it. Live online classes. Accessed anywhere in the world through your mobile, tablet, laptop, PC. If class is missed, recordings can be watched. Batch starts from 5th January 2019, Saturday 6PM. Update: Dec-20-2018- Registration is closed because batch is full. But stay tuned for the next batch announcement. Seats are limited & they’ll continue to increase the fees as the booking process escalates. So, it’s better to book sooner, than pay higher amount later. [BES181/1] Money: Cryptocurrencies not legal tenders in India; What is Marshall Island-SOV, Venezuela-Petro?